Academy products on sale: DIY SEO! Want to optimize your website yourself? Do you know where to start? Do you know what to do? 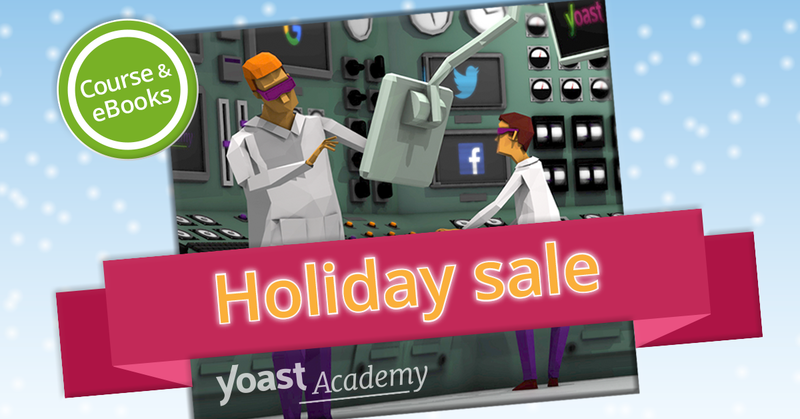 Yoast Academy offers several products that could really help you to optimize your website all by yourself. And because the holidays are coming we’d like to offer you something special! Our Basic SEO training now only costs $199! And also, all of our eBooks are on sale! Most of the important stuff you need to learn to really optimize your website (both for search engines as well as for UX), you can find in our blog, vlog or in our free eBook. Our SEO blog offers lots and lots of information about SEO, usability, conversion and content writing. But it can be quite hard to navigate through all our information, because it’s all captured and fragmented in many, many post on our blog and vlog. That’s why Yoast Academy also offers unique premium eBooks and a course, which will truly help you to optimize your website yourself. Our Basic SEO course will really teach you how to do SEO yourself. It’s THE DIY guide to SEO. The training focuses on all the fundamentals of SEO. You’ll be guided through the information step by step. Our video’s will teach you everything you need to know to start optimizing your website right away. The texts will give you some more in-depth material and the exercises will surely put you to the test. Did you really understand the material? Or should you look into it again? This course will definitely force you to dive into SEO! In the end, you’ll receive a certificate and a badge (to put on your site!). Our eBooks bundle and combine all the information Yoast offers in an insightful manner. They’ll offer a clear guideline to start up your very own SEO strategy. We offer a general SEO eBook (Optimize your WordPress site), a Content SEO eBook and an eBook about UX and Conversion. Because of our holiday sale you can buy an eBook of your choice for only $14. If you buy a bundle of eBooks, the discount gets even larger! Maybe you’ll have some extra time to work on the SEO of your website during the holidays. Or perhaps you want to optimize your website in the new year. Either way, start doing it yourself with our Basic SEO course or with one of our eBooks! Weekly SEO recap: don’t disavow the money!